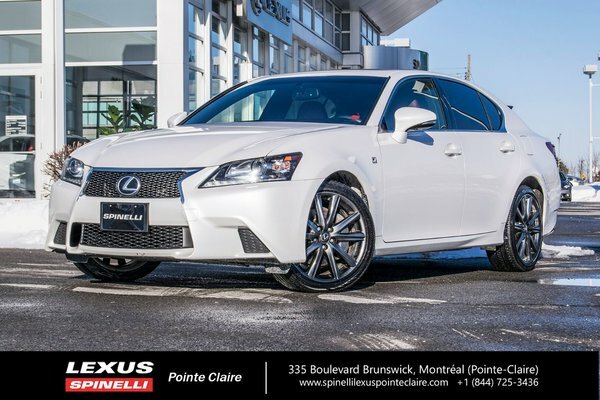 This 2013 LEXUS GS 350 AWD F SPORT was handpicked to complement Spinelli Lexus Pointe-Claire's distinguished pre-owned inventory. This model and color combination is highly desirable. GS 350 F Sport White Starfire Pearl on Red leather. Super low kilometers. Only 49 659 kms! That works out to less than 10 000 kms driven per year! Never accidented. CARFAX vehicle history report available. Remainder of Lexus warranty ending on May 18 2019 or 110 000 kms. Inspected by our lexus certified service department. Don't miss out on a great and rare opportunity! call us now to book an appointment! Buy with confidence from Spinelli, a family owned and operated business in Montreal since1922. We are located at 335 Brunswick Blvd in Pointe-Claire right in front of Fairview Center Pointe-Claire, (one block north of Autoroute 40).